A sedate Seattle fine-dining standby, Tom Douglas’s Dahlia Lounge serves Pacific Northwest/New American favorites with fancy sauces, purées, and sides. Desserts are notably good, so save room. 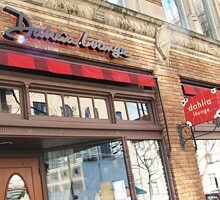 Make reservations for Dahlia Lounge here. Happy Hour Daily 4:30-6 pm ($2.50-$8 food items, $8 cocktails, $7 wine, $5 beer).